Truly Named WGI &COPY; is a truth-in-labeling program joined voluntarily by waterlily growers, wholesalers and retailers among WGI members committed to providing the consumer with plants true to their labeled name. Why is this important? Many people who purchase waterlilies initially want something pretty and colorful for their ponds. However, as interest and understanding increase, they often desire certain waterlilies, those with recognized names that assure specific characteristics. Truly Named WGI &COPY; members believe water gardeners deserve to receive what they pay for and therefore have joined this program to give their assurance that, to the best of their knowledge, they are providing correctly named plants. The program offers two levels of involvement, Participating Members and Certifying Members. Participating Member Growers pledge that their named waterlily hybrids are grown only by vegetative means. For more about this see What's in a Name? 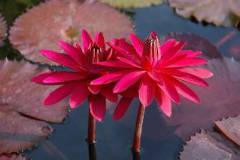 - Guide for Waterlily Buyers. Unknown plants and seedlings of hybrids are offered as unnamed or in color groups such as "pink" or "yellow". Participating Member Wholesalers and Retailers are encouraged to buy from Member Growers or be very certain of their other sources. Wholesalers and retailers who do not grow their own plants are required to provide provenance from the actual growers. They are also encouraged to return incorrectly named waterlilies to the grower. This includes those instances in which varying cultivars in a shipment carry a single cultivar name. Purchasers at all levels, including the end customer are encouraged to return incorrectly named lilies. Participating Member Growers and Wholesalers are listed in the Truly Named WGI &COPY; Directory on this web site and they may display the Truly Named WGI &COPY; logo in their catalogs, sales lists and web sites. They may include Truly Named WGI &COPY; educational information from the WGI web site. Participating Member Retailers are also provided with promotional material to involve and educate their customers. Participating Members may also elect to be Certifying Members. Certifying Members pledge that specific cultivars are true to name. This can be for some or all of the named varieties they offer. Certifying Members submit a list of cultivars that they certify together with a picture of each. If no image is available, detailed provenance can be accepted. These lists and images/or provenance are linked from the Truly Named WGI &COPY; Directory. It is not required that all varieties offered be certified. In order for Certifying Wholesale and Retailers who do not grow their own plants to certify specific varieties, they are required to provide provenance and images from the actual growers, if these are not already in the program. To assure correctness, images are compared to print references and image galleries on the Victoria-Adventure web site, those galleries verified by numerous experts. If there is a question about any given cultivar, Certifying Members may be requested to submit additional images and/or provenance and/or review by acknowledged experts. Cultivars meeting the requirements above are entitled to have the Truly Named WGI &COPY; tag attached to the plants. Those cultivars may also display "Truly Named WGI &COPY; Certified" in catalogs and web sites. Occasional errors are inevitable. Purchasers at each level are encouraged to report errors to WGI, including resolution offered by the seller. Multiple complaints will result in a review by WGI followed by appropriate action. This can include removal from the program. If a non-member, multiple complaints will prevent future participation in the program unless and until the seller/distributor in question can verify that their practices comply with program guidelines. WGI supports Truly Named WGI &COPY; by hosting it and providing as much information about it as possible, through its membership, the significant web presence of Victoria-Adventure, press releases and downloadable material. To become a Truly Named WGI &COPY; Participating Member CLICK HERE. To become a Truly Named WGI &COPY; Certifying Member CLICK HERE.